Secretary-General António Guterres speaking at the United Nations Private Sector Forum 2018, at UN Headquarters in New York, on 24 September 2018. The rate of sustainable development is “too slow” and private business has a major role to play in speeding it up, while also slowing the runaway pace of climate change that threatens the entire world with catastrophe, United Nations Secretary-General António Guterres said Monday. “I am deeply concerned with the fact that climate change is running faster than we are,” he warned the Private Sector Forum, on the eve of the UN General Assembly’s 73rd General Debate, stressing that Governments are losing momentum in achieving the goal of keeping global warming, well below 2 degrees Celsius above industrial levels, by the end of the century. “I think we need to raise the alarm. Not only are things getting worse than expected, what we are witnessing in the world is more dramatic than the worst forecasts that scientists have made a few years ago,” he added. “I strongly believe that the business community can be the driving force together with civil society to make sure that everybody understands that to meet the goals defined in the Paris Agreement (on limiting global warming) is essential, and that not only do we have to be able to respond to the commitments made but we need to have an enhanced ambition and to make stronger commitments,” he said. Hosted annually by the UN Global Compact, a UN partnership with the business community, the Private Sector Forum brings together leading business executives and investors, Heads of State and Government, senior UN leadership and select civil society representatives to take part in an interactive discussion. 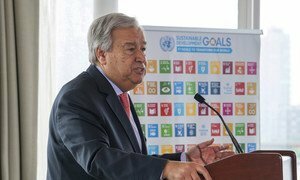 Turning to the Sustainable Development Goals (SDGs) which seek to eliminate a host of social ills in an environmentally friendly way by 2030, Mr. Guterres highlighted the “very important role” of business leaders in mobilizing civil society, business communities and all other relevant actors. Noting that the Global Compact is based on a set of values combining peace, development and human rights, he singled out creating jobs for youth as probably “the most important tool we have today” in preventing conflict. “And so, if companies do their job properly; if companies do their job in the respect for these values and create richness and wealth and help to have communities with cohesion by the way they are integrated in the communities where they operate, companies are indeed contributing decisively for peace,” he declared. 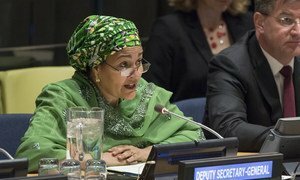 Businesses can contribute in important ways to the realization of a world free of poverty and hunger by 2030, including through job creation, technological innovation and the provision of finance resources, the United Nations Deputy Secretary-General said on Tuesday.